We are acting in the sale of the above property and have received an offer of £58,500 on the property. Any interested parties must submit any higher offers in writing to the selling agent before exchange of contracts takes place. 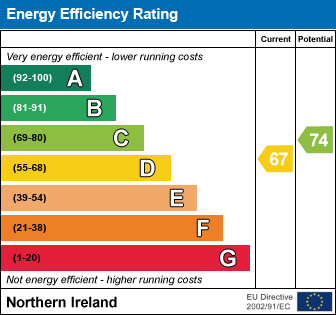 The Energy certificate rating is D67. A first time buy or buy to let investment. This 3 bed terraced home offers 3 bedrooms, a lounge, a kitchen with dining area and a bathroom. It benefits from uPVC double glazing and phoenix gas central heating (not tested - boiler may need repair or replacement). There isn't much here that a bit of time, effort and a modest budget won't sort out so view with an open mind and you won't be disappointed. Wood effect laminate. Phone point. At widest points. Feature wall-mounted electric fireplace. Wood effect laminate flooring. T.V and internet points. Double panelled radiator. At widest points. Range of high and low level units in a wood effect finish with granite effect roll edge worktops. Integrated oven and hobs with matching stainless steel extractor fan. Stainless steel sink and half bowl with mixer taps. Tiled floor and part tiled walls. Single panel radiator. Access to rear. Access to storage. Smoke alarm. Single panel radiator. Built in storage. At widest points. Single panel radiator. Built in storage. White suite comprising bath with electric hand shower. Pedestal wash hand basin and W.C. Heated towel rail. Tiled floor and tiled walls. Lawned area with path to front. Enclosed paved rear with access to communal parking area. Travelling out of Newtownards toward Comber turn right into Blenheim Drive (West Winds) where number 19 is located in the first row on the right. I am interested in 19 Blenheim Drive, Newtownards. Please contact me about this property.